United Kingdom-based video game retailer GAME is currently stocking an exclusive special version of Gearbox’s upcoming first-person shooter Aliens: Colonial Marines for Windows PC, Xbox 360, PlayStation 3. Extermination edition, as it is called, will include several pieces of bonus content for those who pre-order the game, including multiplayer characters, weapons, weapon upgrades, and several items used for player customization. 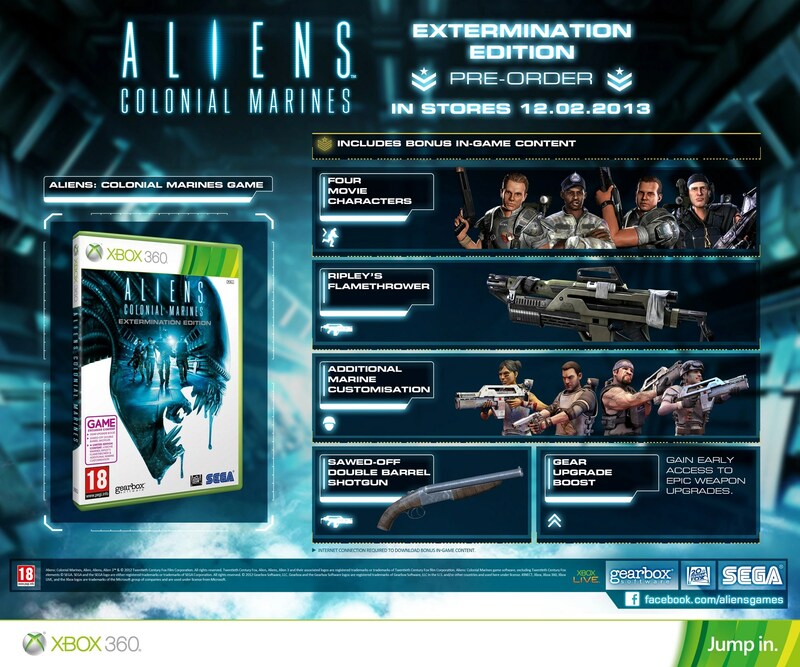 Playable characters available with the Extermination edition include Gunnery Sergeant Apone, Corporal Hicks, and Privates Hudson and Drake from the film Aliens, on which the story of Colonial Marines is based. Other bonuses include two weapons, a flamethrower and a sawed-off double barrel shotgun, additional items that can be used to customize the appearance of the player’s Marine, and a ‘Gear Upgrade Boost’, which will give players early access to high-end equipment and upgrades for their weapons. It is currently unknown whether or not this edition of the game will see release elsewhere in the world, or if this content will become available for download at a later date. Aliens: Colonial Marines will be released worldwide on February 12th, 2013 for Windows PC, Xbox 360, PlayStation 3, and later for Wii U, as well as for OnLive cloud computing services. This entry was posted on December 27, 2012 at 11:35 pm and is filed under PC, PlayStation 3, SEGA News, Special Edition, Wii U, Xbox 360. You can follow any responses to this entry through the RSS 2.0 feed. You can leave a response, or trackback from your own site.